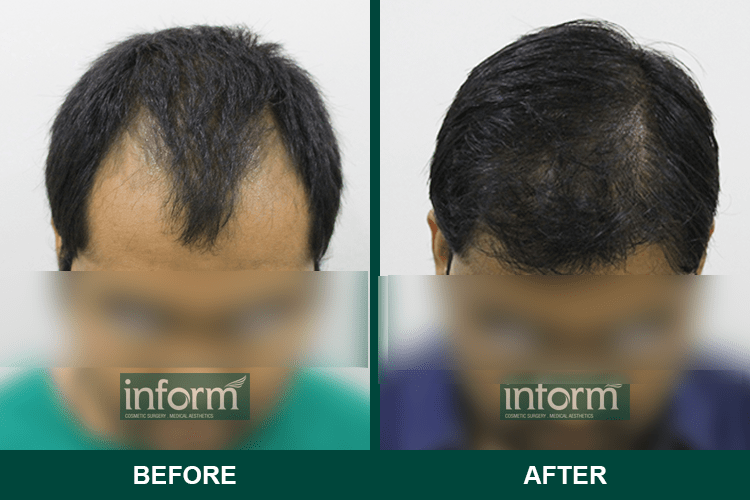 Why Choose Inform Clinic For Hair Transplant in Hyderabad? Inform clinic comes with many additional advantages right from experienced doctors to the skilled staff. below are the listed points that will help you in making an informed decision. Inform clinic is ideal because of its multi-disciplinary staff who have both conventional and complementary knowledge which helps in designing treatment steps for each patient individually. They come together, pool their skill set and information and discuss the ideal program for each patient. Staff at inform possesses excellent training in all the fields of: medical doctors, biological dentists, chiropractors, acupuncturists, stress management and lifestyle coaches, trainers, physical therapists, etc. Training in functional medicine gives them the extra edge in treating root causes with little or no difficulty. This kind of attitude ties the team, together. Inform clinic is designed with full-fledged, comprehensive laboratory, physical and lifestyle assessment infrequently conducted, that can be combined with various other forms of diagnosis and analysis. The process in total helps in thorough evaluation in the patient treatment cycle. This is the essential factors to govern the healthful state of the individual. The sort of environment you are living, the kind of decorum maintained matters to the overall health of the patient. All practitioners at the Inform clinic advocates and adhere to the healthy lifestyle changes. Inform clinic is excellent in communicating information and motivation to the patient concerning, procedures, treatments and lifestyle choices. Patients are advised to learn more about themselves, their needs, choices, and steps to be followed to ensure better state of health. Inform clinic not only treats diseases but addresses to its root level. Taking into consideration the complete history, test reports of diagnosis, personality, and the environment leads to a personalized treatment plan. Regarding the diagnostic tests, another treatment lifestyle plan is tailored to cater to the of needs of the patients. This includes the combination of all the following: surgery, pharmaceuticals, energy medicine, chiropractic, counseling and, acupuncture. There are various traditional and high-tech procedures that are very conducive to increase the healing process, that includes body work treatments, acupuncture, energy medicine, hyperthermia, neural therapy, and many others. These sorts of things can be combined to take great strides toward better health. The Inform clinic is well managed and organized. Every member here is aligned with the same vision, mission for the betterment of the patient. The entire staff is moving toward a common goal to achieve a healthful state of the patient . They are organized and efficiently managed, there is very less possibility for confusion. For the patient, the integrative experience needs to be very smooth. A dedication to providing powerful programs and therapies that work for each patient is a great focus to have. A fully functional hospital will always serve healthful food to patients which include organic fresh fruits, healthy food to match up with the patient’s needs. medical food, vibrant juices, green vegetable drinks, smoothies and nutritious food and drinks are designed to increase the pace of healing. Staff keeps a constant check on you for all the safety reason. Staff takes special care to make sure that toddler, young people and aged ones who may be vulnerable to any sort of danger are kept safe. Staff asks for advice from their colleagues in case of any doubts. Records are complete and kept confidentially. They have all the necessary plans to deal with emergencies during busy periods. The clinic is in hygienic condition to make sure that the risk of infection is as low as possible. FUE Hair transplantation is a minor procedure which is carried out by giving local anesthesia. You will be awake and can easily communicate to the surgeons in case of any sort of discomfort. The local anesthetic is injected into the donor area of the head so to numb the area and then the desired number of hair is extracted from the donor area. They are carefully transplanted in the recipient area. Follicular unit transplant (FUT) is the surgical procedure which involves extracting a strip of hair rather than a graft of hair from the back or the side of the scalp. The strip is then divided into individual grafts. 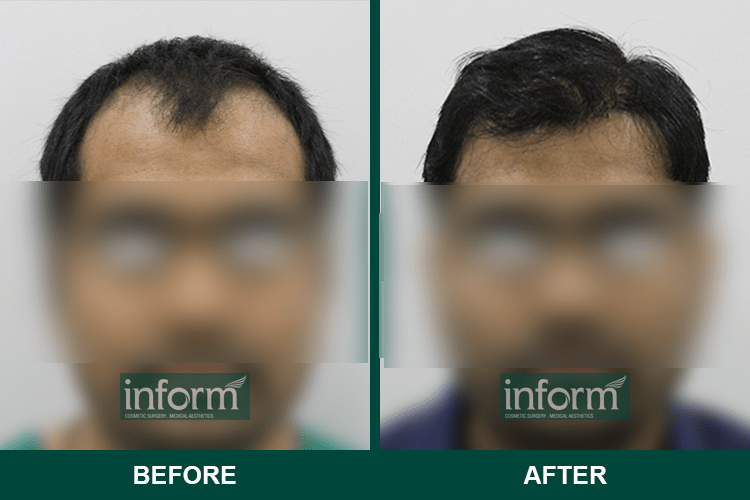 At Inform clinic centre in Hyderabad, we have been performing PRP therapy for past many years.it is a proactive therapeutic option available for male and female patients experiencing hair loss. PRP is a non-surgical option for individuals who require stimulation of hair growth in case of excess hair loss. Mesotherapy is an alternative treatment that can be opted to cure baldness in both the sexes by reducing hair loss and promoting hair growth. This process regulates the proteins, vitamins and other nutrient levels in the scalp of the patient suffering from hair loss. This is a non-surgical method which is least painful as compared to other processes. Robotic hair transplant has two key steps: follicular unit graft harvesting and recipient area creation. The automation of these two steps enables hair transplant surgeons to perform FUE with precision and consistency which allows no wastage of follicles. Stem Cell Therapy (SCT) is the surgical procedure where various disorders, non-serious to life-threatening issues can be resolved by using stem cells. These stem cells can be taken from a lot of different sources as suggested by hair transplant surgeon and can be used to treat more than 80 disorders for instance Leukaemia, Thalassemia, Sickle cell anaemia and MDS. How to Choose the Best Hair Transplant Surgeons? Hair transplant surgeons in Hyderabad are always much spoked about because they make sure that all your queries are resolved, they look at you as someone who is facing some problem and they have resources to address the issue. They will take the time to know you, your entire background thereby, guaranteeing that they know their stuff and that they have solutions to all your doubts. You can easily distinguish these surgeons by seeing the way they respond, those are the initial signs of their professionalism and experience. A surgeon must be educated and trained from a recognised institution. They should have proper knowledge of their field in addition to the proper training required to perform a surgery. Best Hair transplant surgeons in Hyderabad are the best commentator, who is additionally open to any form of new technique introduced in the hair transplant domain, so it goes without saying that they are well trained and capable enough to handle all the issues. A surgeon will unarguably put you first and make sure that you are comfortable. They ought to follow all the rules as set by relevant bodies. Surgeon ought to prioritize your wishes and march forward with the most secure treatment course available. Positivity attracts you in every possible way where being positive can include showing a positive look where you rely on hope for sure. The most evitable is how they speak to you. Your surgeon ought to show strictness amid discussions, yet not with excessive degree of therapeutic language where you start feeling like the helpless soul. They are your constant friend on the entire journey. While surgeons should be knowledgeable in the respective learning, they should rely on their capacities and to handle any sort of surgical crisis as may arise. They should be ready to settle all the queries on the spot. So, the problem may not increase. In addition to strong theoretical knowledge and the valid practical skills, it is of utmost importance that surgeon should have common sense. It enables them to make informed judgments independent of any medical knowledge and training. The most suitable way of developing common sense is the surgical training and subsequent practice thereafter, to deal with any sort of immediate situation. All good surgeons are strong-minded, creative, brave, and demonstrate perseverance when it comes to their patients. Being a good surgeon is a long tedious process. it is expected out of them to follow all the surgical disciplines. They must be flexible as the day is rarely predictable and can be pressurising. they need to take care that they take an informed decision. This ever-changing environment must be an enjoyable challenge to them, not something which drains them off. A good surgeon is the leader of a team, motivates them and welcomes change with an open heart. Accepting the entire responsibility for all results at the end. quick decisions at their end are expected to assume they possess all the necessary skills to undertake all the responsibilities. Good surgeons find it rewarding to take actions and see the outcome of their actions on behalf of their patients. Immediate results can easily sum up for personal success and accomplishment. It is well documented that hair transplantation in Hyderabad is the best compared to all the nearby area in terms of the doctors and staff qualification. When the procedures are compared to others there comes up a number of reasons which indicates the effectiveness of the overall procedure. It not only addresses your hair loss issues but tries to work on the root cause. This means that greater the degree of an individual hair loss, the higher the cost of the hair transplant procedure. Thus, only after the hair transplant surgeons will evaluate your condition that they will be in a better position to cite the exact cost of the treatment. Hair transplant surgeon in Hyderabad has a better expertise as they have an established history and proven track record typically. They typically charge less for a hair transplant procedure as compared to those with extensive experience and expertise. Furthermore, the more complex the procedure the higher the cost, if you desire the best which the industry has to offer, then the cost is certainly going to go up. But one thing should be kept in mind that the person undergoes hair transplant are only based on cost, it shouldn’t be compromised. if you’re planning to undergo hair transplant in Hyderabad, it’s important that you analyze the overall cost according to a city. You must take into account the long-term versus short-term satisfaction levels. The ground rule is,” the more complicated the hair transplant technique, the more it will cost as there would be additional staff involved and use of more machines thereby hiking the cost. For instance, in the FUE procedure, the surgeon has required a more extensive skill set in comparison to FUT hair transplant procedure. Because it is less complicated which involves minimal usage of machines, the FUE procedure is a little bit on a higher scale in terms of cost. Basically, there are two types of hair transplant treatments- FUT (Follicular Unit Transplantation) and FUE (Follicular Unit Extraction). FUT is way cheaper as compared to FUE. Besides the hair transplant method, technology is yet another important cost deciding variant. Clinics using the latest technological devices and machines charge a bit higher because of the common reason to cover the cost. The number of grafts required for the transplantation the area, i.e. the area that needs to be covered with donor's hair as desired by the patient, the desired lusciousness and the volume of recipient's hairs. Based on the above-listed parameters, the surgeons will take into consideration the number of grafts. A number of grafts are directly proportional to the cost. Hair transplant surgeons in Hyderabad who are experienced and qualified with enough training which hikes the cost a little bit more as they charge slightly higher for the expertise they have in consulting and treatment. Hair transplant clinics are very well-equipped with all the advanced hi-tech machines and amenities that are quite costly. If that is the reason then the cost will slightly increase than those offering basic facilities of treatments. Quality, location and brand reputation of Inform clinics in Hyderabad is what sets it apart but the good thing is that the cost is affordable for an individual to undergo treatment without much of an additional pressure. Why Choose Hyderabad for Hair Transplant? Walk into any hospital in Hyderabad and the first thing they assure you is the s availability of beds for patients, that sort of arrangements is made to deal with all the emergencies. If the patient's condition is very serious, the hospital authorities are quick to correct actions quickly and hair transplant surgeons in Hyderabad are well qualified to address any sort of complex issues. This is all-pervading in the hospitals of Hyderabad. According to the data, there has been a huge development in healthcare industry of Hyderabad. The government here have realized that the sector is important, as health is of utmost importance to any individual and shouldn’t be compromised. More hospital beds are being added every day to cater the increasing need. Small and budget hospitals are opening every day to provide quick access to everyone with less hassle. Many factors, that have fuelled the growth of hospitals is the hike in population in the Hi-tech city and medical tourism. The government has given many subsidiaries to promote healthcare. In this last decade, Hyderabad has witnessed a steep increase in growth. And, apparently, the metropolitan area has a population close to 6.5 million to cater the medical needs of that huge population healthcare units are booming with various better facilities so that the issues are addressed quickly under hassle-free. Why Don’t Hair Transplants Look Natural? According to the best hair transplant in Hyderabad,”If hair transplant doesn’t give a natural look, it can be due to bad hair transplant treatment. hair restorations go unnoticed by you but everyone else can note the difference. natural hair grows in small groupings called follicular units of 1, 2, 3 or occasionally 4 hairs per unit. At hair transplant in Hyderabad, we try to replicate your previous growth pattern by placing and randomly dispersing 1-, 2-, 3-, and 4-hair units”. hair transplant procedure follicles are taken from the very backside and sides of the head and placed artfully at the balding areas. The result would be very natural looking hair. In simple words, we take hair from area where you have luscious growth and put it where you need it more. For most of the patients, transplanted hair lasts for lifetime. In rare cases, a very small percentage of transplanted hair may be lost as the patient ages and if properly taken care that condition to can also be avoided. Is hair transplant procedure painful? Patients are administered with local anaesthetics and other prescribed medications, depending upon the degree of pain or discomfort caused during or after –the procedure which may differ from patient to patient. Medicines can be prescribed post procedure, if needed. Many of our patients usually don’t require any medication after the hair transplant procedure. The number of grafts depends entirely upon the degree of hair loss you have suffered and how luscious and full you desire your hair to look like. Micro hair transplantation procedure uses incisions that are very small and less painful than previously followed procedures. That results in increased pace of healing. Most patients feel okay within two post-surgery, although some sort of numbness and mild soreness can be expected within some days . Immediately, post-surgery a patient’s recipient area is pink with shells forming around the micro incisions done during transplant. These hundreds of incisions will heal within some days post - surgery, person’s hair transplants will be visible if, there are no hair around to mask those transplanted shells. However, most patients feel quite comfortable in public as the changes goes unnoticed post-surgery. Normally, it takes five months post-surgery before transplanted follicles begin to grow into new hair. The transplanted hair grows in a very thin texture than before then it gradually gets thicker and fuller with time. After around one-year, patient’s transplanted follicles will be completely mature and will continue to have a luscious growth. hair follicles that are transplanted to the balding areas are resistant to go bald, they will continue to grow like any natural hair growth. so, it is safe to say that transplanted hair are permanent. Transplanted hair follicles start to grow after about 2-3 months normally they grow up to ½ cm/month. The clients start to see results mostly after 6-7 months. These transplanted hair roots replicate the behaviour as like natural hair. The transplanted hair can be cut or trimmed regularly after growth depending upon the personal styling of a person. you can shampoo these hairs or dye like natural hairs. 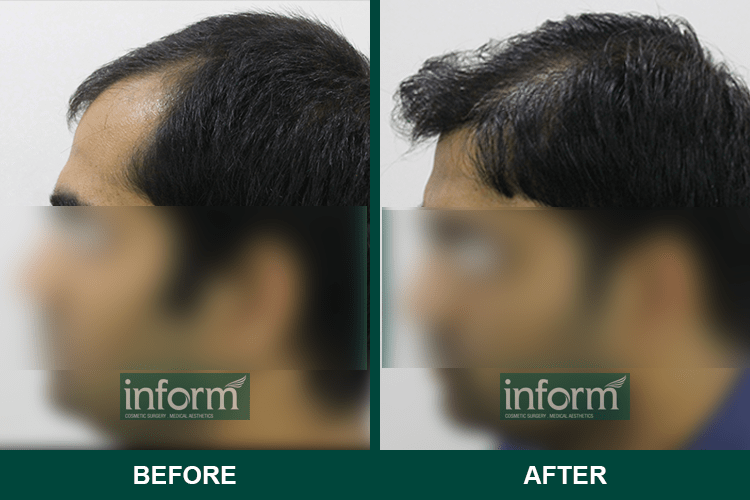 Hi, I am Sabrina I had undergone my hair transplant procedure at Inform clinic Hyderabad. It was a good experience, kind compassionate doctor and helpful staff is what I found good about Inform clinic. I am thankful to the hair transplant surgeon for solving all my queries. I wasn’t sure initially what I am getting into when I first signed up but during the consultation, all my doubts were properly addressed, doctors here are very helpful. I look beautiful now. I no longer dread meeting new people, I don’t have any signs of wrinkles as I care less as to how I look. All my insecurities have just vanished I no longer put my head down in a senseless effort to hide my face. Many people around dreamt of having a job which can change their life but for me what I wished was the transformation which can ultimately transform my life. I would like to appreciate the efforts of hair transplant surgeon in Hyderabad and of the overall team for delivering such fantastic results.